An annoying thing about snorkeling is the jellyfish. Yes, there are jellyfish out there, not everywhere and not all the time. On the Big Island of Hawaii they are mostly small, almost like a snowflake. On occasion, we have come across a slightly larger ones. They just ride the water flow past you. Every once in awhile you might get a little sting; hardly painful, like a pin pressing against your skin - no puncture, no swelling, just annoying. If you have a camera and are trying to focus on an epic fish picture, sometimes your automatic focus picks the jelly instead, again, annoying. 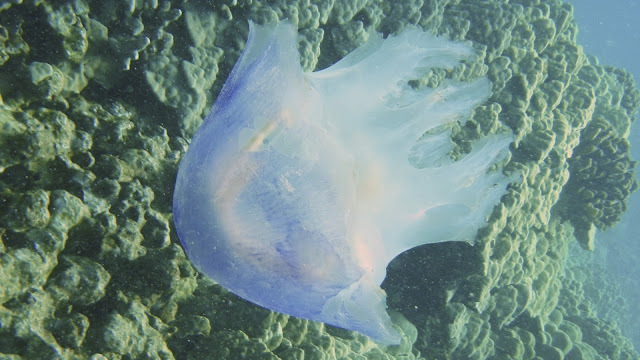 Now, we have come across jellyfish in the life threatening way off the coast of Florida, but on the Big Island of Hawaii, so far, nothing but annoyance. On this particular day, we came across a giant. Well, a giant in our world. He was not what he used to be, but still a big guy - bright blue to purple orb, transparent to his core. It is rare to see a jellyfish of this size on the Big Island when snorkeling.